Syria: Whatever happened to Kobani? 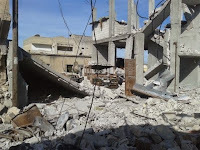 BEIRUT, 7 May 2015 (IRIN) - Seven months ago, all eyes were on the Syrian town of Kobani as Islamic State militants and local Kurdish forces battled it out to the last fighter. An estimated 400,000 Kurds fled across the border into Turkey. During the 16 weeks since the so-called Islamic State (IS) was driven out, many residents have come back to find a town in desperate need of international aid. They wonder why it has been so slow to arrive. Returning to try to rebuild their shattered lives, they tread carefully for fear of IS booby traps and unexploded ordnance. Sometimes, too often, they get it wrong. Since late January, there have been 45 explosions and 66 people killed, the vast majority of them civilians, one demining NGO told IRIN. The black flag of IS was raised above Kobani in October as the jihadists took control. An American-led coalition bombed the militants. Kurdish Peshmerga fighters and elements of the Free Syrian Army rebels joined the fight against IS. Victory finally came mid-January as the Kurds reclaimed the town and the Islamists were driven back further into Syria. The Kurds celebrated. The United States called it a major defeat for IS. But, with victory came a painful realisation. As residents returned home, the scale of the devastation became clear. Up to 70 percent of Kobani had been destroyed or damaged by airstrikes and months of street battles. The southern part, which had been under IS control, was decimated. The fleeing militants left booby traps in some of the buildings that remained, while unexploded bombs dropped by the US-led coalition pose further problems. Nevertheless, thousands of residents have made the journey back, with up to 70,000 people now living in the town, according to aid workers. Kobani is in desperate need of a large-scale demining operation, but funding has been slow to emerge. An aid worker who had recently returned from Kobani admitted some frustration at the pace of the aid effort so far but was hopeful that major projects would be confirmed in the coming days. Sean Sutton, International Communications Manager with the NGO Mines Advisory Group (MAG), said he was hopeful funding for a clearance program would be confirmed in the coming days. “Some of the main streets have been cleared and local authorities have stockpiled ordnance. Everywhere there is rubble, and a pre-requisite to rebuilding will be to search the rubble for explosives." A lot of people have been in to do assessments but not a lot is being done yet, he admitted. “There are organisations, but they don’t seem to be doing anything yet,” Ahmed, who recently returned to the city, told IRIN. Beyond demining, the town is in desperate need of a comprehensive rebuilding plan. Hundreds of thousands of Kobani residents remain in camps in southern Turkey, many of them in limbo, anxious to return. Ahmed, who was a teacher in Kobani before the crisis, said his family is waiting across the border in Turkey for rebuilding to begin. “Everyone is waiting. Every single member of Kobani will return if we can,” he said. But huge numbers of people can’t simply return to a town where the infrastructure has been completely destroyed. Hakmat Ahmad, external relations officer at the Health Authority in Kobani, said that while a number of NGOs could provide treatment at their clinics, a larger scheme to help rebuild the medical system had not been developed. “The region is still insecure, the scale of destruction huge and we don’t have access to the city to support a voluntary return programme,” it said. Residents insist that the area is now safe by Syrian standards and point out that it is both costly and unsustainable to keep the refugees in camps in Turkey. The NGO worker said food aid was a priority and that his organisation was already stocking up for next winter. Whatever numbers come back, life is slowly returning to Kobani. Exactly ten years after I first published this blog, today is the last day of publication. I would like to thank IRIN for the excellent content they have provided over the years. Without their cooperation and the hard, often dangerous work of their journalists, this blog could not have lasted so long.